This current piece of work is inspired by two museum collections which I have been reseraching over the last six months; The London Foundling Hospital and The Museum of Costume in Bath. In ‘The London Foundling Hospital Museum’ we view the heartbreaking reminders of abandoned children and babies who’s mothers entrusted their care to the hospital in the Eighteenth Century. 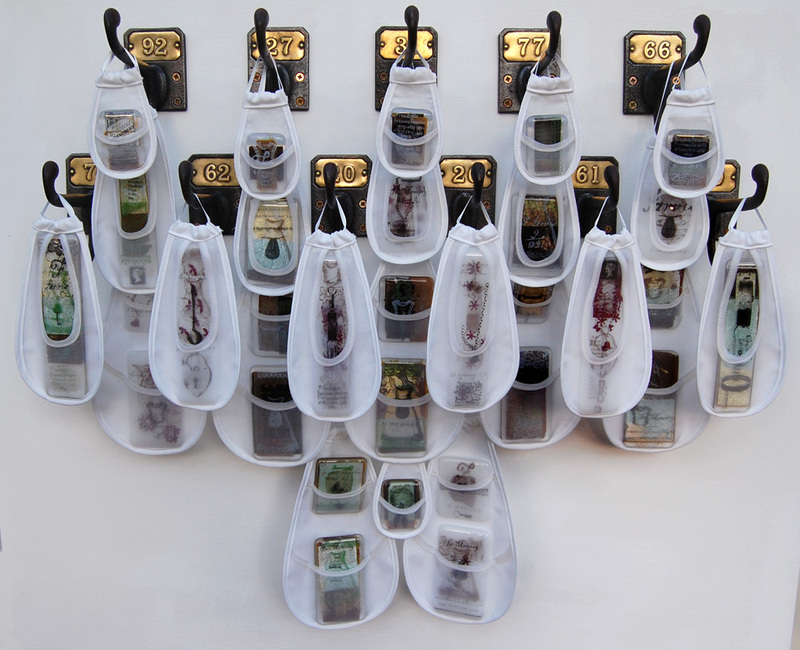 The collection holds displays of tiny mementos; ‘tokens’, which were handed over by the mothers with the hope of being reunited with their children at some time in the future. These identification ‘tokens’ were items of little value and range from keys, padlocks, coins, ribbons and embroidered fabric, symbolising the bond between mother and child. 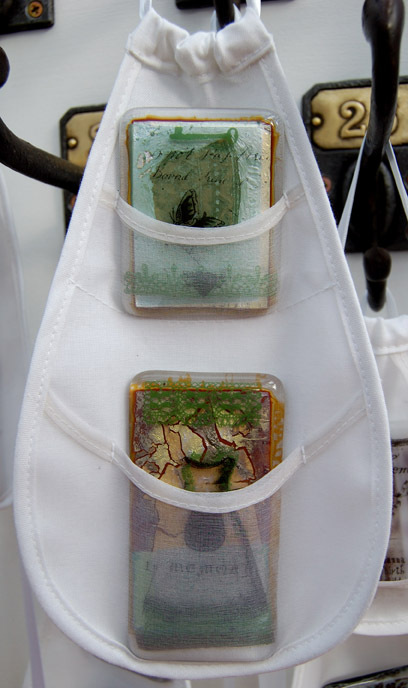 In the Eighteenth Century women would have worn ‘pockets’, as containers for personal belongings and secret items to be kept out of sight. The pockets were a separate garment tied underneath the outer clothing around the waist and would be out of view. At this time women would have no private spaces to keep personal property and their pockets would have provided a perfect hiding place for any personal valuables, mementos, undisclosed letters and secrets. As ideas for this project developed, I made some visual research at The Museum of Fashion and Costume in Bath, where I was able to view, handle and scrutinise Eighteenth Century pockets from their collection. The pockets from this period range from basic utilitarian items made in robust cotton, nearly worn to threadbare rag, to highly decorative pieces made with fine crewel work embroidery. ‘Lost Pockets’ has combined ideas from these two historical collections of both ‘object’ and ‘container. 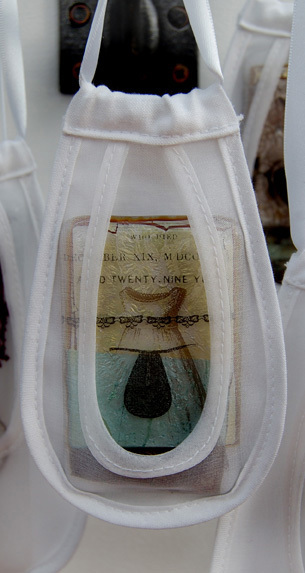 This holds vast possibilities and potential for interpretation of imagery with glass and textiles and my pre-occupation with the historical garment, women and confinement. The glass utilises the qualities of fusing with inclusions such as silver, gold and copper leaf metal and enamel screen printed imagery referring to the tokens in the Foundling. 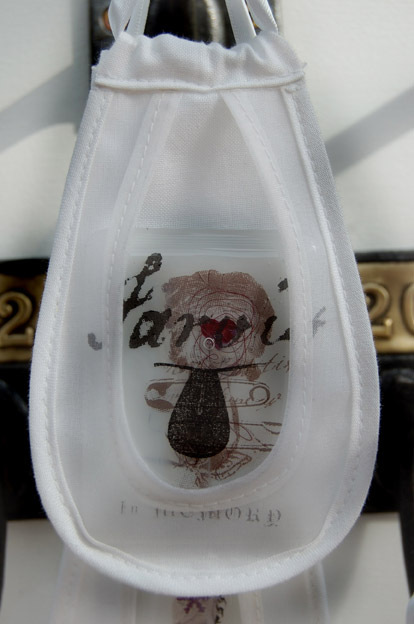 The pocket containers reference the purity, innocence and ignorance of the ‘lost children’ with the use of white silk organza, cotton and satin ribbon. The numbered hooks echo lost property and the glass pieces hang in varied scale ‘pockets’ to suggest the unidentified lives of children and their absent mothers from this period in history.